For my Mommabear's birthday this past weekend, she wanted to go see Life of Pi. I jumped at the chance. Usually I'm not crazy about my favorite books getting made into movies, but the previews for this one looked like they had put a lot into it. 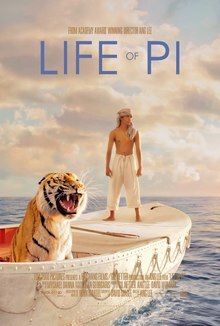 I read Life of Pi back in high school and devoured it (heh... get it like a Tiger) in one day. I felt every emotion with that book. It devastated me, it was thought provoking, and the ending blew. my. mind. Even years later I would think back and wonder what was real or not. If you haven't read it yet. I highly suggest you do so in the very near future. It did pretty much everything the book did. It made my whole family sob our hearts out. It illustrated the ideas about religion that the book presented. And my goodness it was BEAUTIFUL. We saw in in 2d (none of my family is very big on 3d movies... and they give the birthday girl headaches) but I can see how some of the scenes they did would have been astonishing in 3d. The colors were amazing. The transitions between scenes were really fantastically put together. I would go again just so I could immerse myself back into some of those scenes. Why it did not get a full 5 stars. And this is a pretty big point for me... The movie lined up with the book pretty well the whole time (in fact I think it was almost a scene for scene replica) UNTIL THE END. This is a problem because the end of the book is what made it so special to me for so many years. I'm going to try and talk about this without being spoiler-y or vague. Fingers crossed. The same ending is presented in the movie... but it is done in a different way. One that is a lot less mind blowing. In fact it's almost an after thought- and just kind of meh. My family (who hadn't read the book before seeing the movie) left saying "Oh well that was nice...okay what's for dinner now" instead of going back and forth wondering what actually happened like the book does to you. It wasn't enough to ruin the whole movie, but I think it takes away from the story as a whole. I know it's been out for a while now... but if you get a chance I would highly recommend seeing it on the big screen if you get a chance. 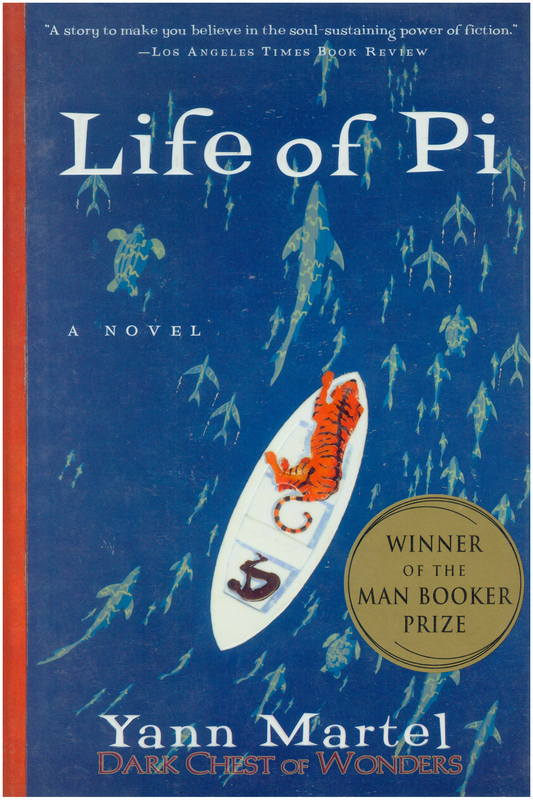 I haven't yet read Life of Pi, though a copy sits on my bookshelf. The previews for the movie look amazing and I really do want to see it, particularly after reading your review. I have tried reading this book loads of times i am sorry but it bores me i read 2 - 3 pages then don't touch it for ages. I'll keep going at it coz i never give up on a book. One of these days I'm going to finish this book. I've tried 3 times and I refuse to allow it to be the book that I abandoned. During the years I worked at a bookstore, it was always one of those polarizing books that you either loved or hated. I actually saw the movie before having a chance to read the book, which normally I don't like to do. This one I thought was an okay movie, until the end when I thought it was elevated into a good movie. My coworker and I talked about religion and the ending the whole way back to the hotel (I saw it when I was on a business trip). So maybe for your family it didn't have that twisty thing, but my mind was blown. I have to agree. When I read this book I nearly lost my mind because NO ONE I KNEW READ IT! I kept begging everyone to read it so I could discuss the ending with them. My husband said, "Just tell me what happened and we can talk about it." I insisted that was NOT going to help me. So finally, the movie came out and we were able to discuss it. It was a decent conversation, but I reminded him of the furious passion I had years ago and he said he could only imagine how much more powerful this must have been in the book. I highly recommend the movie, but, even more, the book is a must-read! I had to read it my first year of college and I wasn't a big fan. It was hard for me to get into it though the end was pretty good. I'm really interested in seeing the movie though. What a shame! It only just came out in the UK yesterday and I've been so excited, At least I've read the book! I had to read the book in gr. 8, and like you, the ending just left me stunned. Then I saw the movie and I feel exactly the same as you - I loved the movie but the ending was just so unimportant.